WEST Coast booked its spot in a preliminary final on Saturday night, earning a place in the final four with an entertaining and hard-fought 16-point victory over Collingwood. With the game played at a heightened intensity throughout, the see-sawing contest was on the line with five minutes remaining. Then came the moment that mattered. 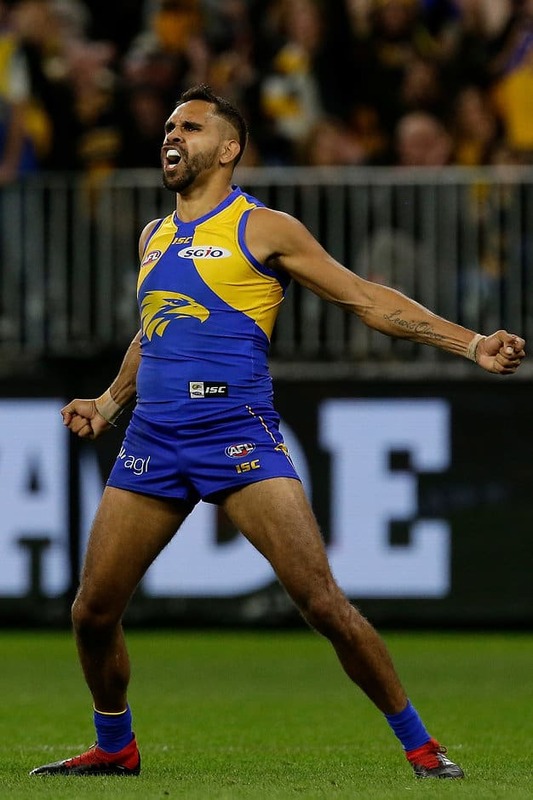 West Coast had grinded Collingwood down, the atmosphere around Optus Stadium had risen to fever pitch and the crowd of nearly 60,000 fans – mostly Eagles supporters – were baying for a moment to lift their side to victory. With West Coast two points down with just over five minutes remaining in an intense qualifying final, the hosts thrust the ball forward in the hope of reclaiming the lead. Tom Langdon's thumping 20m spoil appeared to clear the danger for Collingwood, especially when the loose footy fell straight into the arms of Taylor Adams. However, tackled by Liam Duggan right on the 50m arc, his handball was intercepted by Lewis Jetta. The Eagles speedster claimed the footy, side-stepped around Langdon with class and composure and snapped a crucial goal to hand West Coast the ascendency in the contest. If that wasn't enough, then came the celebration. Mimicking Portuguese footballing great Cristiano Ronaldo, Jetta whipped the West Coast supporters into a frenzy. It wasn't a bad way for Jetta to mark his first goal for the 2018 season. Not only did it give West Coast the lead, it also sparked a run of three goals in the final eight minutes for the hosts, helping them secure a 16-point win and book their spot in a home preliminary final in a fortnight's time. Lewis Jetta was the man. His interception of Taylor Adams' handball would have made the likes of Richard Sherman proud, while his side-step around Tom Langdon typified his naturally calm and composed demeanour. His right-foot snap from 45m out was all class, while his celebration was just as cool. It was a sensational individual effort. It essentially booked West Coast a home preliminary final. Down by two points with just over five minutes remaining when it happened, the goal sparked the Eagles into life and helped them finish with three majors in the last eight minutes to secure the win. The Pies had been holding on to a slender advantage for much of the final term, with the momentum generated from Jetta's goal finally breaking their resolve. West Coast will now play the winner of next week's semi between Hawthorn and Melbourne for a spot in the Grand Final. While it was Jetta who kicked the goal, it was the Ronaldo celebration that nearly stole the show. Leaping into the air and turning 180 degrees while doing it, Jetta landed with his arms by his side – reminiscent of Ronaldo's famous and frequently seen goal celebration during his time at Real Madrid. The celebration has been dubbed by many as the 'Right here, right now' and, speaking to Channel 7 after the game, Jetta revealed the motivation: "There's only one other bloke that does that. He's way more famous than me, Cristiano Ronaldo. I thought 'If I kick a goal, I'm just going to do that'. I love Ronaldo." HOW DID THEY CALL IT? "Adams … Stolen by Jetta … One-step kick … Can Jetta kick the goal? Jetta can!" - Luke Darcy, Channel 7. Wild. The crowd of 59,585 people at Optus Stadium had already lifted the decibel count a couple of notches prior to Jetta's goal, nearly taking the roof off the place when it went through. West Coast's supporters didn't need reminding of how important the goal was, with the Eagles now one step away from returning to a Grand Final for the first time since 2015. Start booking your tickets for the preliminary final, West Coast fans. “He had some really good moments and some moments with the ball that we questioned in the box. I think we’ve just got to accept that, because when he stands up … and what he’s done as an individual this year – he’s a real leader among the indigenous players at the club. He’s taken that to another level. I saw him after I spoke at three-quarter time and he got the boys in and just talked about what they were going to do as a unit. I thought Liam Ryan and Willie Rioli really stood up in the last quarter as well. For a game that big, for those boys to produce in some of the bigger moments I thought was really pleasing.” - West Coast coach Adam Simpson.